ZoOSh – Dare to be different! A lot of times, eating food becomes like a mundane task because of the uninspiring and uninteresting flavors. What is supposed to be a pleasurable and flavorful event, becomes dull and boring. You want to get done with it rather than enjoying it to the fullest. Don't you wish you could add more flavor to boring food and make its flavors stand out? 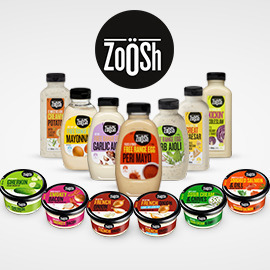 ZoOSh is a salad dressings, dips and mayonnaise brand from Australia. But it’s much more than that. ZoOSh doesn’t accept the status quo, ZoOSh is a flavor adventurer and a champion of flavors. Their various products are a wake up for the taste buds to not be satisfied with boring food. ZoOSh provide outstanding flavors that dare you and your food to be different. It’s for foodies who are not satisfied with the ‘same old’ and never get complacent with their food. It’s for anyone who wants a more interesting eating experience and wants to feel great about it. These are people who are always on the look-out for fresh produce, the latest and greatest in food trends, want to experiment with the flavors of their food and dare to be different! We want your help in bringing alive this idea and show us why and how ZoOSh helps you dare to be different. Through an inspirational poster with tagline, show us why and how ZoOSh dares you and your food to be different. Format: Poster with tagline and text to describe the idea.